We woke naturally before the alarm went off at 6am to get ready to go to Long Island Sound (LIS) via the East River and under Hell Gate Bridge. First we had to take the outboard engine off the dinghy, then we docked the boat on the end of the floating dock and took showers. We cast off at 758am just minutes before our target of 8am. We had a favorable current all the way in. 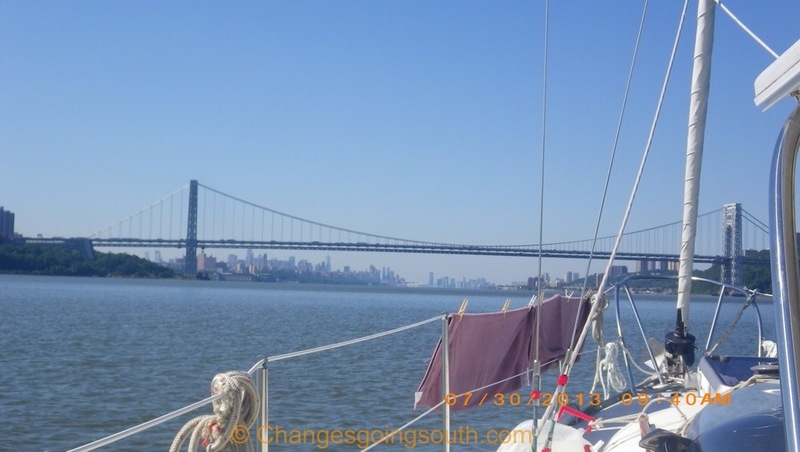 We were to Yonkers NY by 930am with a speed of 6.24k B and 8.0k G. 35 min later we passed under the George Washington Bridge, which for insurance companies signals that the boat is on the East coast. We had already changed over to Looper Insurance 4-5 days before with Ace Insurance. What is Looper Insurance? It’s for those that are traveling on the US rivers and Great Lakes to do The Great Loop to get to the Gulf Coast and up the east coast. Even though we are not doing the the Great Loop, it will also cover us for where we are going and in the Bahamas. Click on the highlighted words to get more information. 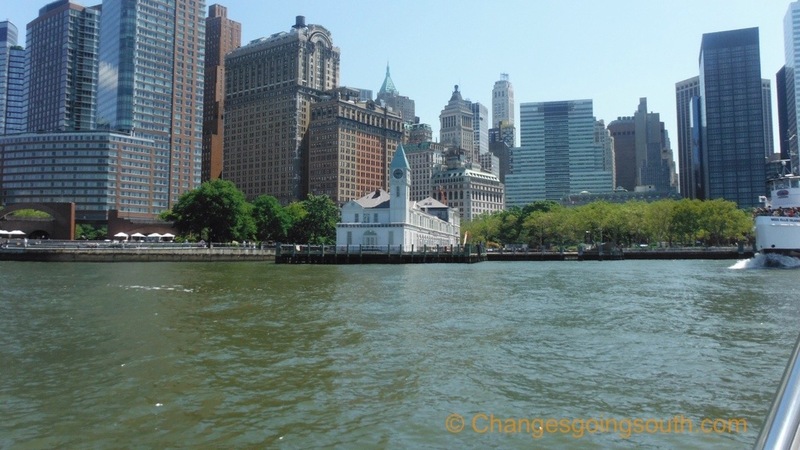 We passed The Battery Park on the tip of Manhattan. We timed entering the East River at this point when the tide was just starting to flood at Hell Gate Bridge to go through with a favorable current. 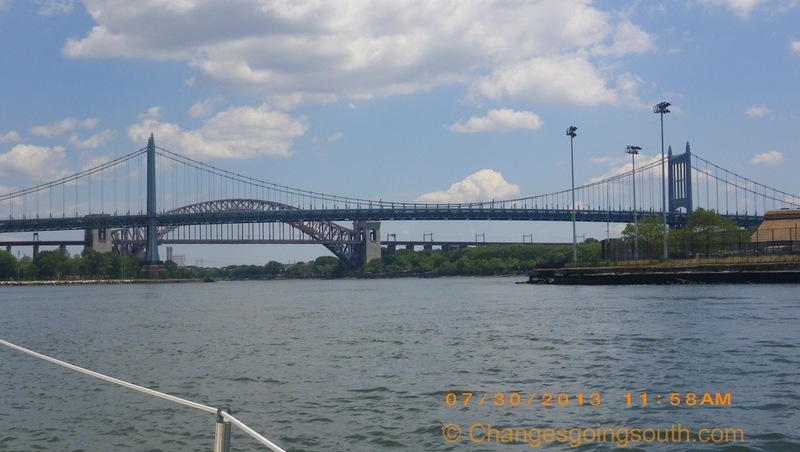 Phil was at the helm after the George Washington Bridge as there was so much commercial traffic in the river that the AIS alarm was going off constantly! We had to change the range down to 0.5nm just to have it reasonable. 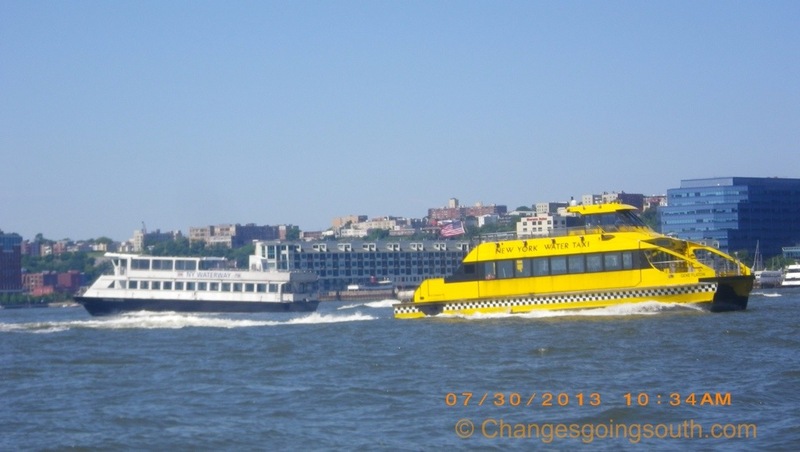 Of course there was many water taxies, ferry traffic, and sightseeing triple level boats on the river along with other sail and power boats. There were only a few barges and tugs around. 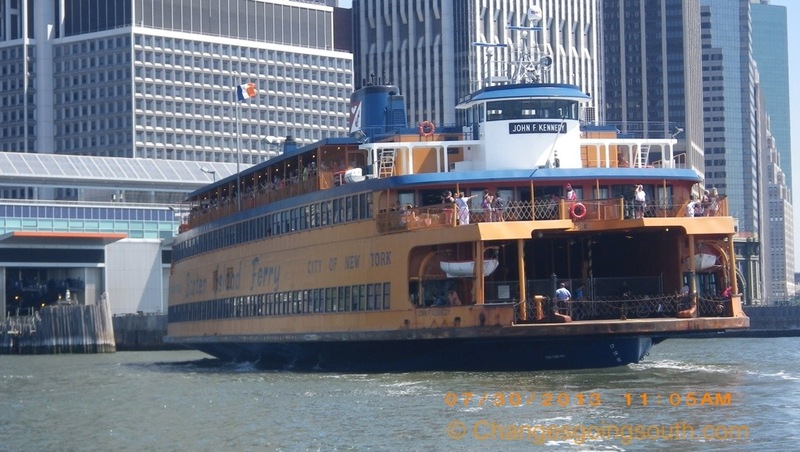 Then the Staten Island Ferry was coming in to dock and we had to steer to go behind her. Soon after we rounded the corner, the commercial traffic decreased dramatically. 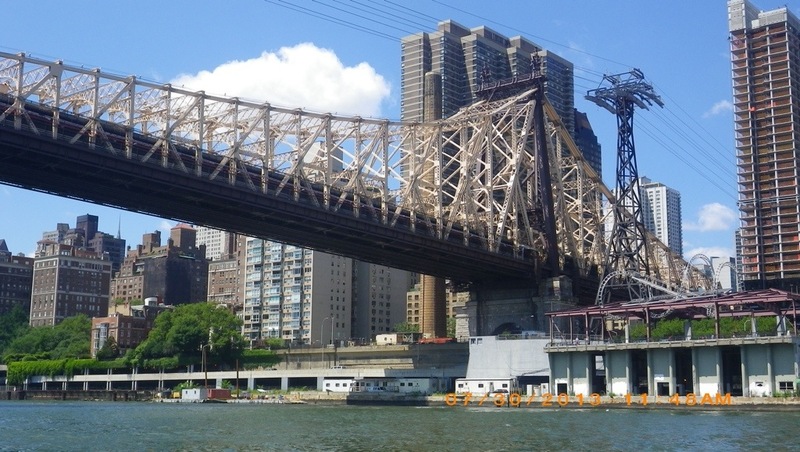 One of the unique features of our trip was the bridges we went under on our trip today and seeing Manhattan from the other side. 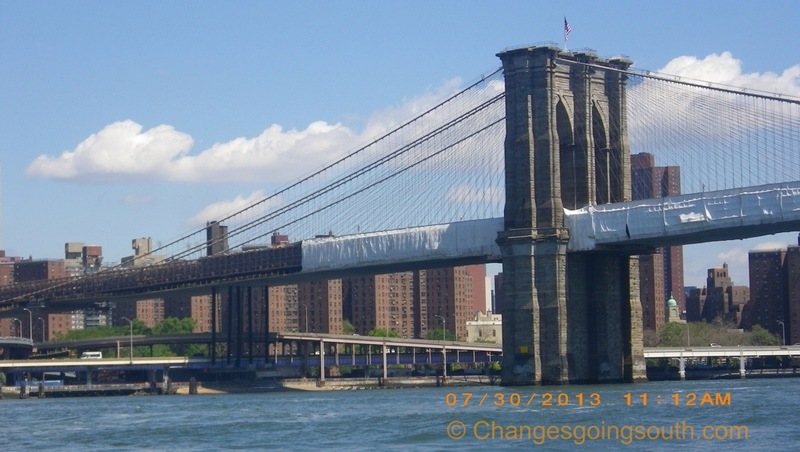 First on the East River is the Brooklyn Bridge with working being done. 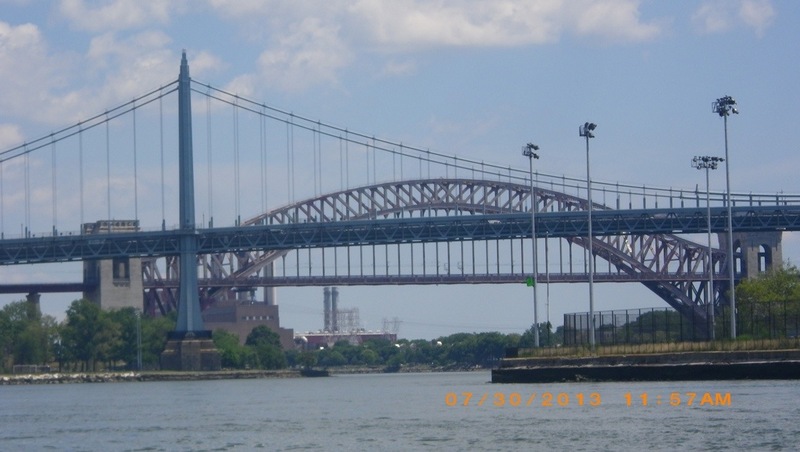 The Triborough Bridge just before Hell Gate Bridge. 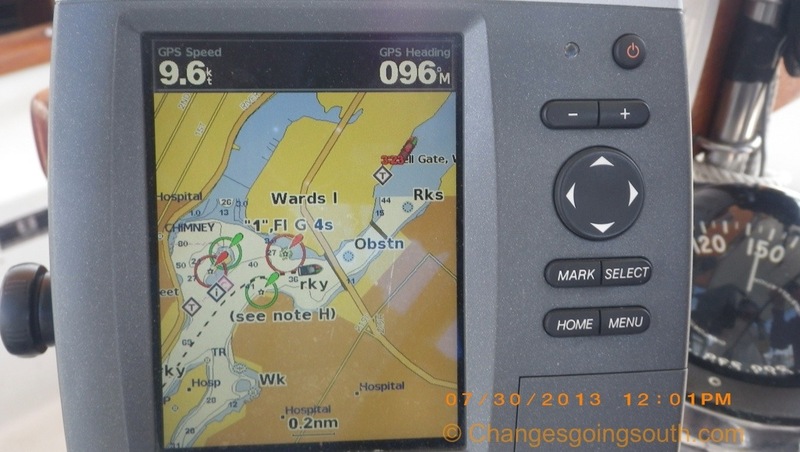 Here is our GPS entering Hell Gate area. Our maximum GPS speed was 9.6kts! Phil and I don’t that it was that bad and we’ve been through worse current, but that’s because we timed it right. About this point, Lorraine was tired and had another one of her naps and woke up as we were going through Frog’s Neck into Long Island Sound. We drove to the west side of City Island, and dropped the hook at 135pm on the edge of the mooring field. Supper was warmed up chicken breast, potatoes and snap peas cooked in foil packets on the grill. After supper, Phil read while Lorraine worked on the blog and we talked to some friends about visiting them during our travels. Later we had fresh bread rolls, cheese and fruit with wine for our cocktail hour. Tomorrow we plan to go down a little bit further east in LIS, probably to Oyster Bay as Jim recommended. We are still working on our plans and look forward to talking to Patty and Gary further. 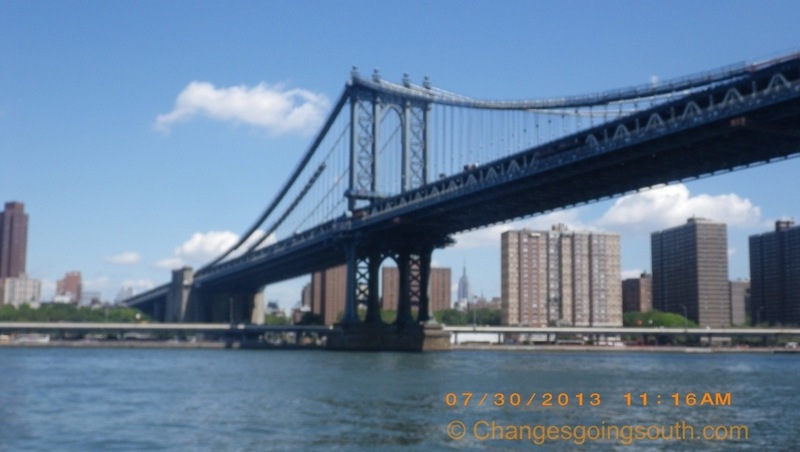 This entry was posted in 2013, Long Island Sound, New York, United States and tagged Bridges, currents, Hell Gate, NYC., Travel day. Bookmark the permalink. Thanks for that information! We will check it out. Thanks for the tip. Any other tips for free mooring balls or dinghy docks east of that? We plan to end up in Westbrook, CT on Sunday. Really love your photos and comments!! Great pics of the bridges! Enjoy! Me too! Looking forward to seeing Chet and Carol and Patty and Gary. We will and thanks. Have you a date yet when you are leaving?